Most of the above reports are for pretty pictures to impress management. They can be easily copied into MS Word or MS PowerPoint. But what if...among the hundreds of reports in SMS Pro...that you have a special need. You have plenty of data for analysis, but this report is so unique that only your company would probably consider it. SMS Pro™ has the Data Analysis and Export module that allows you to export your data from the SMS Pro™ database and conduct your own MS Excel data analysis. Data Analysis and Export offers management with a way of investigating data and exporting to various formats without involving IT support personnel. Earlier versions of SMS Pro™ called this module "Quick Sort." The new name, "Data Analysis & Export" is more descriptive and fitting. Data Analysis & Export offers much more than what the name conveys. Data Analysis & Export is a dynamic, on-the-fly sorting tool whereby managers can categorize and sort aviation incident and accident report information quickly and easily. This module lies under "Risk Management >> Data Analysis & Export. Some earlier portals used Quick Sort as the name of this module to export data from SMS Pro™. Data Analysis & Export provides a means to conduct ad hoc queries on reported accidents and incidents without IT support. Results can be exported to Word, Excel and PDF. Managers can easily see lists of reported accidents and incidents, as well as their initial risk assessments. Auditors also use Data Analysis & Export to quickly see which accidents and incidents they have previously reviewed. 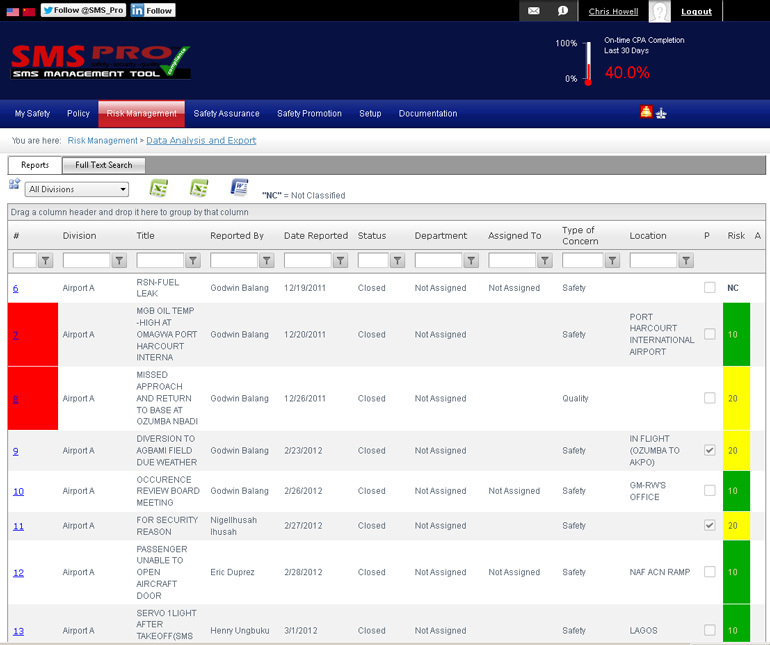 Auditors also use Data Analysis & Export to see which item other auditors have also reviewed. Finally, full text search capability exists with Data Analysis & Export. One can search on reported accident and incident elements not visible to users, such as "Short Description," "Issue Comments," "Corrective/Preventive Actions" and "Lessons Learned." Select a division in the drop-down list to view only issues from that division, or select "All Divisions" to view issues from all divisions. A table will be displayed listing issues from the selected division. Each issue in the table has a "Details" link that will open that issue in the "Details" tab in Issue Manager. The issues can be filtered based on the values listed in any of the columns. To filter the table, type a value into the box at the top of the column, and click the filter icon to the right of the box. A menu will be displayed containing the filter options, such as "Contains", to display only issues containing the entered text, or "DoesNotContain", to display only issues that do not contain the entered text. A filter can be removed by clicking the filter icon and selecting "NoFilter" from the filter menu. The issues can also be sorted on any one of the columns. To sort on a column, click that column's header. The sort order can be reversed by clicking the column header a second time. Clicking the colunn header a third time will remove the sorting. Sorting on another column will remove the sorting from the previously sorted column. Issues can be grouped by draging the column header to the colored bar at the top of the table. Multiple grouping levels can be defined by draging multiple column headers to the grouping bar. Grouping levels can be removed by draging the group title off of the grouping bar. The contents of the table can also be exported to Microsoft Excel or Microsoft Word. The "Export All Rows to Excel" and "Export All to Word" buttons will export all rows in the table, excluding those that have been removed by any filters, to Excel or Word, respectively. The "Export Visible Rows to Excel" button will export to Excel only those rows that are currently displayed on the visible page. Filters on the "Reports" tab are limited in filtering or searching for values visible in the grid. With Full Text Search, one can conduct a search on elements not visible to the users. Exporting data from SMS Pro™ using full text searching capabilities is a very powerful feature. After finding items of interest, active links appear in the far left column for which users can select and view the details of the accident or incident in the Issue Manager. Users possessing the "Auditor" role have access to functionality not visible to other users, including SMS Admins. These auditor abilities are hardly utilized to their full potential. Auditors visit companies and may conduct audits on how the company handled reported issues. They may conduct the audit using a "random sampling" of issues or they may review every reported issue. When Auditors review issues, they are able to leave remarks, findings, concerns or submit new issues from the "Assess" tab in Issue Manager. Again, they have access to functionality not visible to other managers. After the auditor leaves comments on the reviewed issue, he may want to see what he reviewed. Alternatively, he may wish to review what he audited the last time he visited, or he may wish to see what other auditors reviewed and see their comments. The Auditor Filter is visible only to Auditor role users. At the bottom of the grid, two calendar controls are available, along with a dropdown list of users who have the Auditor role. Auditors may enter a From Date, a To Date, and select an auditor. An auditor must be selected, as this triggers the command to refill the grid according to the query parameters. All issues falling within the report range are returned, and those items that had been previously reviewed by the auditor are highlighted for easy recognition.